In the modern world, the things that go bump in the night are real. As a vampire, werewolf, mummy, poltergeist or zombie, you stalk the city after dark, searching for human victims to sate your inhuman appetites. Be it blood, bones, brains, organs or spirit that you crave, you prowl the shadows in search of prey. But your victims are not helpless! They run for their lives and do whatever it takes to survive. Other monsters may even devour your intended prey, whether for sustenance or to spite you. 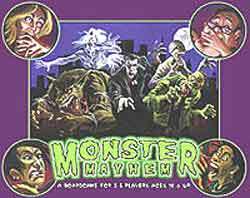 Monster Mayhem is a light-hearted game of going bump in the night — and eating people! Consume the most of the living dish you crave and you rule the sleeping city.